Dr. Justin Sanchez, director of DARPA’s Biological Technologies Office, delivered the first two advanced “LUKE” arms from a new production line during a ceremony Thursday — evidence that the fast-track DARPA research effort has completed its transition into a commercial enterprise, DARPA officials said. The ceremony took place at Walter Reed National Military Medical Center in Bethesda, Md. 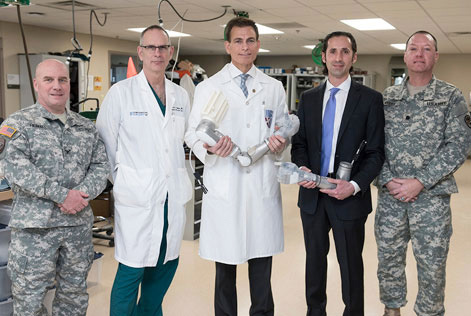 The first production versions of “LUKE” arms, a groundbreaking upper-limb prostheses, were on display during a ceremony at Walter Reed National Military Medical Center in Bethesda, Md., Dec. 22, 2016 The Defense Advanced Research Projects Agency is collaborating with Walter Reed to make the bionic arms available to service members and veterans who are rehabilitating after suffering upper-limb loss. 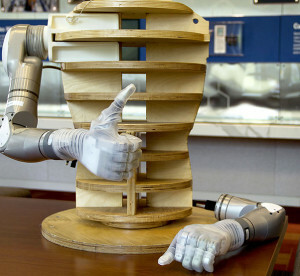 Under a recently finalized agreement between DARPA and Walter Reed, DARPA will transfer LUKE arms from an initial production run to the medical center for prescription to patients. Mobius Bionics will train the Walter Reed staff tofit, service and support the arms. Left to right: Army Col. Michael Heimall, director of Walter Reed National Military Medical Center in Bethesda, Md. ; Air Force Col. (Dr.) Jeffrey Bailey, Walter Reed’s director for surgery; Dr. Paul Pasquina, Walter Reed’s chief of orthopedics and rehabilitation; Dr. Justin Sanchez, director of the Defense Advanced Research Projects Agency’s Biological Technologies Office; and Lt. Col. (Dr.) Keith Myers, director of Walter Reed’s Amputee Clinic, pose for a photo at Walter Reed following a ceremony marking the delivery of a groundbreaking upper-limb prosthesis, Dec. 22, 2016.